I have a lot of Mommy guilt. I pretty much set my kids up for a life of take out and fast food becuase I never taught them how to cook. How could this be you ask? Aren't you a fabulous cook who teases us all the time with pictures of food and your latest recipes?! Yes, I am. Thank you for that compliment! 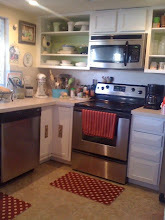 And, yes I didn't teach my 4 kids because the truth is...my kitchen is tiny and my patience is even tinier! THERE I SAID IT. I have no patience. Teaching is not my gift. With all that being said, I have guided my kids through some basic kitchen skills and those (the girls) of them who have shown an interest in experiementing with flavors and recipes have learned a few dishes and tricks. The whole point being, now that my girls are off to college, I'm scrambling to put together some sort of cookbook for them! The tried and true, yummy and simple, make you miss your Mama kind of recipes. I figured I should just start blogging on my COOKING blog and just leave them a digital legacy of my recipes and cooking shenannigans! No need to download a bunch of templates or pay for someone else to make my recipes look pretty, I have a blog! Yahooie! Look out girls and boys, Mama is coming with a whole new blog of our families favorites! !